Very often you want to attach a file to the jobsheet. For example you might have some 3rd party software for created gas certificates, electrical safety reports, PAT tests, a bespoke form filled form another application. 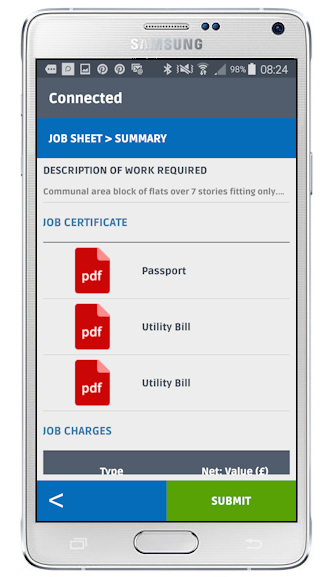 Whatever it is, as long as you have saved in on your phone you can attach it to the jobsheet in the field app. Pretty much anything - PDF, Word, Excel, CSV, any kind of image file PNG, JPG, GIF - anything fairly standard produced bu most software. Once the file has been embedded into the job sheet it is clickable at the other end. So, your client or user in the office can open and view it at the click of a button. It means that Flobot Field app will work with all kinds of 3rd party apps that produce an output file and allow you to wrap it all up in one place, kept together for reference against a specific job, account or client..
Can't get a connection? Don't panic. Flobot stores the file attachment into the jobsheet and on your phone so you will still be able to work even when you can't get a 3G or 4G signal. And when you do get one, it will sync with the server automatically and send the jobsheet back to the office. The Flobot app is for those who work outside the office 'in the field' - but most likely in a van. So if that's you, it gives you everything you need to do you job - the customer's address - which it will navigate you to, the details of the job, the telephone numbers and email address. Press a button and it will send an sms to your customer to tell them when you will arrive. In combination with Android's voice recognition capabilities, Flobot allows you to speak directly into your smart phone or tablet to update job notes. It's great for slow typers and you'll be amazed at how quick and accurate it is. The notes will be added to the client's record. You can even add pictures and video to upload directly to Flobot so that your office team can see exactly what's happening on site. You'll know that in business, getting your customer to sign-off work that's been completed is an important way of protecting revenue and avoiding disputes. Flobot app allows you to capture these signatures electronically and transmit them alongside the job data safely and securely. Thanks to Flobot app's built in, secure GPS functionality, you can see where all of your field team members are in real time on a map. The 'En-route' button lets client know that your field team member is on their way by sending an SMS, and it will even calculate their ETA. Every check in and check out is geo-location stamped so you'll always be sure that your engineer is at the right place at the right time. Many service industry sectors require completion of certificates, such as Gas Safety Certificates or Waste Transfer Documents and these have historically been paper based and cumbersome. If you have an app for them just attach them to Flobot and send them into the office. It means you can ditch the triplicate pad and complete your certificates and documents electronically. Simple, efficient and quick. Flobot is simple to learn but why not save time? Find out it will work for you with a real-time demo. What are you waiting for? © Fresh Milk Software 2018 All rights reserved.